This season we've invited new faces to the team to introduce themselves and provide a little background on what led them to our research program. We first met Brigid, followed by Samantha. Now it's time to meet Molly, who worked offshore on the first Roseway Basin trip and will be spending the rest of the season surveying the Bay of Fundy on the R/V Nereid. Hi! My name is Molly McEntee, and I am an intern with the NEAq Lubec team this season. I was lucky enough to see my first right whale in the Bay of Fundy ten years ago, when I was an 8th grader in Bill McWeeny's Adams School science class. When I was 12, I was part of the first class of Calvineers, a school conservation and education group dedicated to North Atlantic right whales. We visited the Whale House here in Lubec, went whale watching in the Bay, and even attended the 2005 North Atlantic Right Whale Consortium Annual Meeting! Since then, I've received a biology degree from Williams College, and works in a couple different areas of field biology, including pollination biology and deep sea biology. 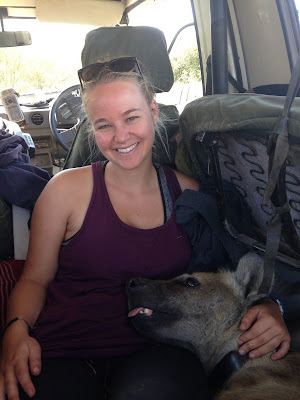 I spent the past year living and working in a tented research camp in Maasai Mara, Kenya, studying the behavior of spotted hyenas, which was an incredible experience. Molly gets some quality time with "Java," a spotted hyena. I am thrilled to be back in the Bay of Fundy after ten years away, even though I haven't seen any right whales this season! I'm hopeful that more whales will turn up soon, and I'll be ready when they do!